Design and programming for modern web sites! With KolbeNet, your web site is no just a template that we paste your information into! You want your site to stand out with a unique look and a familiar feel! We provide a mix of layout and features that people expect with a custom design that looks more like a gourmet meal than something that came out of a can. 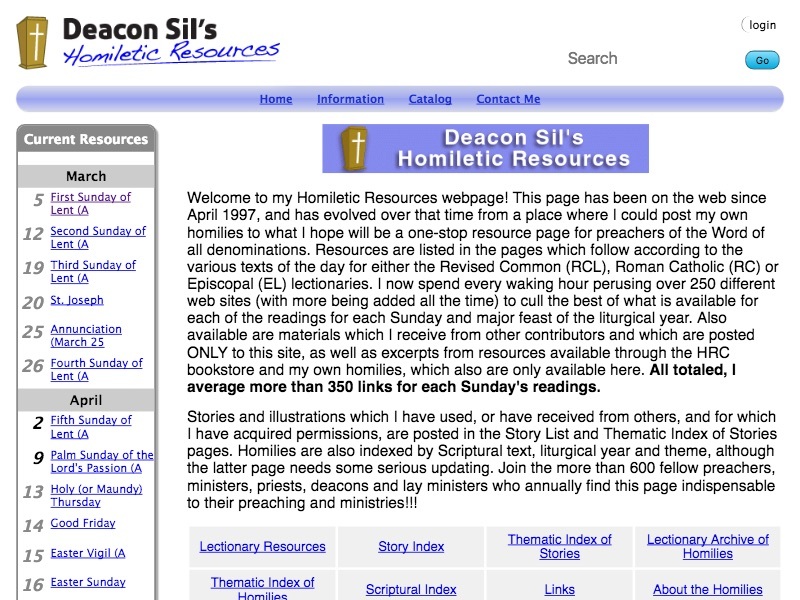 Deacon Sil's Homiletic Resources web site had been maintained manually for years. Over 25,000 pages for different events and days of the year with almost 225,000 links spread out over those pages! This became a problem! As a page was about to become relevant, he and his wife would check each link on that page manually to make sure it still worked. Duplicates and errors were hard to find. His members wanted more modern features that were impossible to implement. Deacon Sil has been with KolbeNet for more years than we can remember, so he came to us for help! We completely overhauled and redesigned the site — a daunting task! We programmed an importer that was able to import all of those pages and links (with their hand-written inconsistencies) into a database. We created an environment for his members that allow them to rate resources, mark favorites and mark which resources they've used. We automated a large portion of the site's maintenance. Now the site checks links for him! When a link is found bad it is removed from all pages that it appears on. Bad links that become good again are automatically put back. The list of current pages is automatically generated from a schedule — no need to change it by hand on a weekly basis. We were able to make things happen that were unimaginable before we took on the project! Most sites are priced as a package. Our standard rate for design, programming and maintenance of a web site is $67.00 per hour. However, most sites are priced as a package which makes them cheaper and gives you the comfort of knowing what the final cost will be. Rough estimate: $200 per page. For a basic site then you can estimate around $200 per page. That's a very rough number but it gives you some idea of what to expect. Custom quotes can be better. Once we learn of your specific needs we might be able to cut costs a little. If your site requires custom programming (see below) then it may raise that price. Common interactive content is inexpensive. A lot of common interactive tasks are accomplished by a simple form that sends you an email when someone fills it out. These are usually easy to create and add only a nominal amount to the final price. Custom interactive programming is extra. For real custom programming, some truly unique way that you would like your site to interact with visitors, we would have to discuss the details with you in order to provide a price. We do not hard sell! You can feel free to request information from us without worrying about the hassle after the fact. We may follow-up a couple of times but you won't be getting phone calls and emails every day and nobody will be pushy. We'll determine what you need. This includes all of the details of what we expect to do for you along with a price quote. Changes are made if necessary. We usually ask for 50% before we begin the project. We'll probably ask you some questions as details come up. Once everything is in place we'll ask you to "proof" the site. We'll tell you what isn't complete yet and ask you to review everything. Tell us of any major problems. Corrections are usually easier at this point. At this point the site is almost complete so we ask for the remaining 50% to be paid before doing the finishing touches. Once everything is ready we'll ask you to review it again to make sure it is ready to go live. Go live! This is a happy day for everyone!